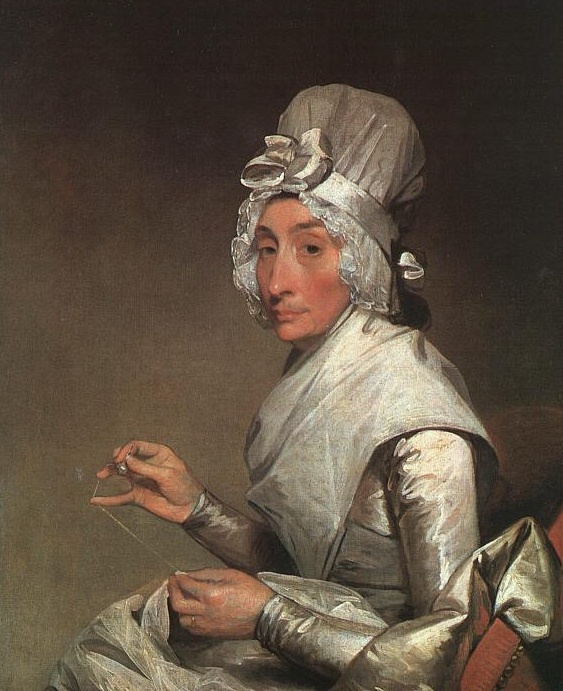 Charm, rather than authority, is what usually strikes one in American painting from the colonial period, but the work of Gilbert Stuart (1755-1828) obviously rises above that level. He painted the iconic image of George Washington, and many other portraits in the impressive English manner of that period–so impressive, indeed, and masterly, but also conventional, that easy as they are to admire, they are hard to love. “Mrs Richard Yates,” however, belongs in a different, more intimate category. Part of the joy of it is the sheer technique. Look at her left arm–the glimmering material is no pedestrian rendering, but a flurry of loose, confident brushstrokes. Or how the cool, jittery highlights in her hat set off the sober warm tones of her face. How her hat fades, for no reason except compositional convenience, into a darker tone so that it sits back into the darkness behind her head rather than bouncing out. Or how the soft, reddish form of her chair reaches up to her shoulder and forms a long diagonal with the material in her lap, securing her in the lower right-hand corner. And then of course that fascinating right hand, paler and cooler than the face, so as not to compete. The silvery thimble rhymes the color and brilliance of her dress in a subtle unifying note. So: a brilliant piece of work, but in the service of character description: alert, purposeful, strong, and nobody’s fool. Not a generic “lady,” but Mrs. Richard Yates and nobody else. Well, almost nobody else. It could be a portrait of a formidable New England matron I observed as a child, one Miss Twitchell (really), a person of vast sternness. She was obviously not the model for this painting, but body and soul it’s just how I remember her. She was a bank teller in Gorham, a small New Hampshire town. That bank was not, as banks are now, an open, welcoming institution. Upon entry you were confronted with a floor-to-ceiling wooden partition with a small, closely-barred window behind which lurked Miss Twitchell. One day a robber came in, stuck the muzzle of a pistol between the bars, and said, “Gimme the money.” “Won’t,” snapped Miss Twitchell, and dropped to the floor, out of sight. The bars were substantial, the door from the lobby to the rear area was locked; there was nothing the robber could do. He fled, empty-handed.